Operating approximately 130 retail stores, Foot Locker Canada has become a highly recognized, preferred destination for youthful consumers who desire unique and exclusive branded athletic product to fit their individual lifestyles, whether for fashion or function. 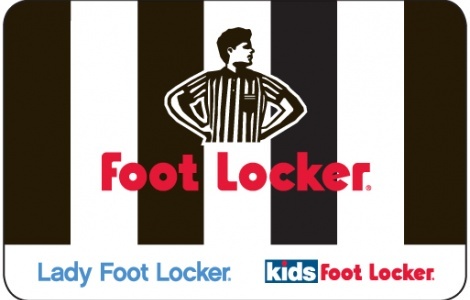 Order your Foot Locker Canada gift cards today! Card has no value until activated at register. Use of this card constitutes acceptance of the following terms and conditions. This card entitles the holder to apply the balance on the card to the purchase of future goods when presented at time of purchase at any Foot Locker store in Canada. This card cannot be used to pay credit card balances. This card will not be exchanged or redeemed for cash except as required by law. Not valid for catalogue or Internet purchases. No replacement card will be issued if this card is lost or stolen. Our standard return policy applies to goods purchased with this gift card, provided that any eligible refunds will only be issued as a credit to the gift card account. For information about your card, including card balance call 1-888-815-2365. This gift card is issued by and is the property of Foot Locker Canada, Co. For the Foot Locker store nearest you, visit us at footlocker.ca.